Details Pasha de Cartier 2790. Stainless steel 40mm case. Stainless steel unidirectional bezel. 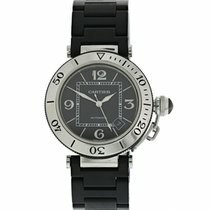 Black dial with steel, luminous hands and white numerals. Date display at 4:30 o'clock. Black, leather strap with original buckle will fit up to a 6-inch wrist. Water resistant up to 330ft/100m. Sapphire crystal. Automatic movement. This watch is backed by our one year warranty.